The Bank of England has come out today (see chart above) and said that as the economy is recovering a bit quicker than expected, that inflation may increase more than it had previously predicted; All very well couched, as usual. However, it seems to think inflation is unlikely to go to much more than 2% by 2012 and that interest rates will head to the same level by then. The BOE has been spectacularly wrong during this recession, keeping interests rates too high; might they have gone gone the other way now? It is not likely, the high chance of a renewed recession next year is discounted, even when a cursory glance at the banks, quantitative easing and government deficit suggest a very bumpy 2011. As such UK rates will remain low; don't go rushing to fix your mortgages just yet. Still in deflation mode; that is ominous. I would have thought we would have hit the inflation wall by now. Yes, so many are living on borrowed time. What can be done if Government will not make spending cuts and in the process is making it worse for us for longer, even if interest rates are low? Still at least the roads are getting fixed while there is money about. That doesn't mean a rocky road doesn't lie ahead though. I never really believed the hytp-inflation scare stories any more than the deflation scare stories, it all cancels out. However, am pleased to advise that NS&I now offer just under 4% for a one-year fixed term cash investment. It'd be nice if my interest income beat inflation for a change. NSI growth bond at 4% MW. Interesting is that this was paying just 1% in September and was hopelessly out of step with everyone else. Also, interestingly if you consider the government commitment to send work to the Post Offices,this product has been withdrawn from over the counter sales on the day the rates changed. It is Online only. Got the internet granddad? No? Not for you then. MW - my spelelling errors are legendary! Glad you always pont them out. This should all time out just as my ten year fix comes to an end. So that I miss out on low interest and MISS OUT on the protection from high interest that I've paid so much for for so bloody long. Watch what I do - then do the exactly the opposite. BQ, the monthly interest, interest access account went down from 4% to 1% between 08 and 09, and has now gone up to 2% again. The 4% is only for one-year fixed. Those on small incomes like myself know that inflation has never gone away. I have no mortgage (so don't gain from the lower bank rate); vastly reduced interest on my small savings and food inflation is currently 9 per cent. Inflation will spike again when VAT goes back up to 17.5 per cent. Browned off? - you bet. Food inflation - 9%. I believe it. Btw what's your sauce? sorry..source? I heard garbage years ago from some civil servant about "an envelope of points" as illustrated in that graph. It's arrogance to assume that you know all the possibilities that lie ahead. I am a fan of the fan too - much better to give ideas of a range than a straight line prediction. Particularly with the BOE's form on such forecasting. 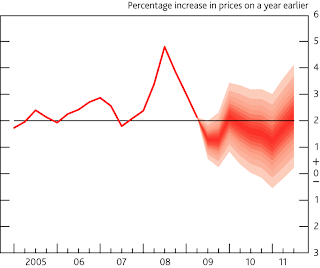 Measured - Food price inflation: I will try to find the reference. I think it was an article measuring a basket of food shopping in a magazine or newspaper. Nick - what did the envelope look like in mid 2008? I just thought there might be a widely recognised index on this which I didn't know about. The supermarkets are giving less for your money without a doubt. Maybe the BofE will end up eating its words; I feel false markets and real interest rates will be on the menu next year. Yo dude - where's the deflation? Can anyone explain why 2% inflation is regarded as a good thing? Being a pensioner, I would really prefer it if my fixed income remained fixed, and wasn't inflated away - even slowly - so as to benefit the indigent. But I suppose that's too much to hope for. I wish I'd bought some gold when Broon was selling. The first job of a central bank is to lie to the public. You could say that that is one part of their job that they are good at. It is almost a cadaver.